Right in the City of London, an exciting new exhibition opens today at the Guildhall Art Gallery. It celebrates the story of 20th century’s Black British cultural heritage, social and political history. And it is a free and interactive exhibition that is aimed at showcasing some of the important aspects of the Black British Experience as well as some of the important figures that helped shape Britain and Black Britain. The exhibition takes its impetus from the life and works of pioneering Black civil rights campaigners Eric and Jessica Huntley, in addition to showcasing a number of prominent Black artists from the same era. In the late 1960s, activists and publishers Jessica and her Husband Eric Huntley, co-founded the pioneering, London-based Bogle-L'Ouverture Publications (BLP). Named in honour of two heroes of Caribbean resistance, Toussaint L'Ouverture and Paul Bogle, and deeply rooted in the concerns of the African diaspora, BLP began as a small, unorthodox, self-financing venture that brought a radical perspective to non-fiction, fiction, poetry and children's books. The company went on to publish works by a growing list of notable authors, among them Andrew Salkey, Linton Kwesi Johnson, Lemn Sissay and Valerie Bloom. For over 50 years, the Huntleys were at the forefront of community activism, from campaigning against the controversial "sus" laws that allowed police to stop and search anyone on the suspicion of intent to commit an offence – with black youths believed to be particularly targeted to organising the largest-ever protest march of Black Britons in the wake of the deaths of 13 young black people in a fire in south-east London in 1981; and the setting up of Keskidee Centre, Britain's first Afro-Caribbean cultural centre. 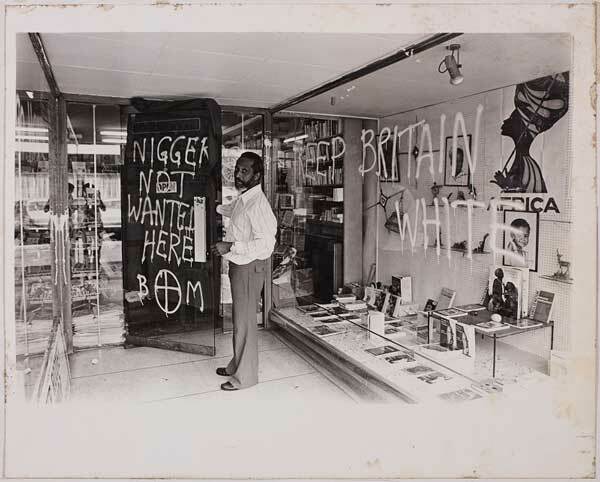 At the heart of the exhibition will be a multi-sensory, interactive recreation of the Huntley's 'Walter Rodney Bookshop' in West London, which became a focal point for Black artists, writers and activists as they carved out their cultural space in Britain. This part of the exhibition is created by renowned artist and curator Dr Michael McMillan (West Indian Front Room) and sound and visual specialists, Dubmorphology. Visitors will be able to immerse themselves in a stunning multi-sensory, multi-visual experience including works of art, sculpture, photographs, paintings, letters and other artefacts from more than 25 prominent Black artists during this period including Eddie Chambers, Sonia Boyce, Denzil Forrester and Chila Kumari Burman. Influenced by the emergence of newly independent African and Caribbean states, global liberation struggles, the fight against unfair discrimination and an insistence on dignified citizenship within Britain, these artists found expression by way of ‘creation for liberation’. The exhibition will explore these struggles and celebrate their contribution through four powerful themes: ‘Elbow Room’, ‘Broad Shoulders’, ‘Clenched Fists’ and ‘Open Arms’. The Guildhall Art Gallery is part of the City of London’s evolving ‘cultural hub’, a vibrant, multi-cultural area and this multi-sensory exhibition will be open daily providing visitors with a unique opportunity to explore the significance of Black British culture and the importance of its historical contribution to the UK and its wider impact as a political designation. Throughout its tenure, ‘No Colour Bar: Black British Art in Action 1960-1990’, will also play host to a series of scheduled events enriching the visitor experience through a diverse range of educational talks, workshops and gallery tours. One of the highlights of the programme of events is the Tenth Annual Huntley Conference, which takes place on Saturday, October 10, 2015, in the Old Library. This youth-led, inter-generational conference will explore new thinking and ideas raised by the exhibition. Beverley Mason, Project Manager for ‘No Colour Bar: Black British Art in Action 1960-1990’, says her organisation is excited to share this vital period in British contemporary history to new audiences and uncover the voices and creative vision of world class Black British artists, who were inspired by, or directly worked with, the pioneering Huntleys. Opening times: Open: Mon-Sat, 10am-5pm, Sun 12-4pm. Nearest Underground stations: Bank, St. Pauls, Mansion House or Moorgate.